Manchester City were crowned Barclays Premier League champions for the second time in three years after coasting to a 2-0 win over West Ham. Manuel Pellegrini's side realistically only needed a point to secure the title and there was no repeat of the final-day drama of two years ago, when Sergio Aguero's last-gasp strike against Queens Park Rangers ensured they became champions of England for the first time in 44 years. West Ham were unable to live with Man City in a one-sided encounter on Sunday, and Samir Nasri gave the home side a thoroughly deserved half-time lead at Etihad Stadium. 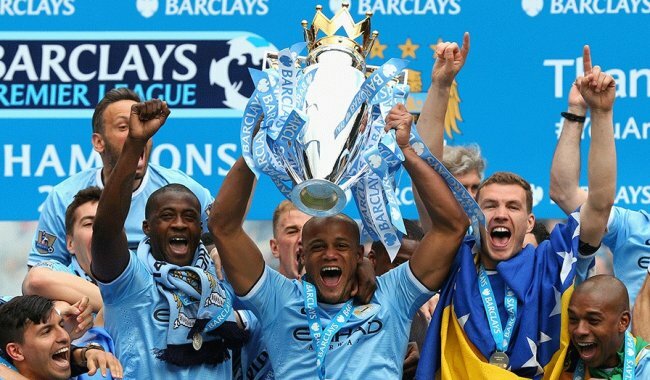 Captain Vincent Kompany doubled the advantage early in the second half to ensure Pellegrini marked his first season in English football by winning both the Barclays Premier League and the Capital One Cup. City's final-day victory ensured they won 17 out of 19 Barclays Premier League matches at Etihad Stadium this season and took their goal tally to 102 in the top flight during a superb debut season at the helm for their Chilean manager. Liverpool came from behind to beat nine-man Newcastle United 2-1, but it was not enough for them to claim a first league title since 1990. Brendan Rodgers' men went into the final match of the season on Sunday knowing that a win, combined with City losing at home to West Ham, would end a 24-year wait for their coronation. Martin Skrtel, a regular source of goals in important matches for Rodgers' side throughout the campaign, put through his own net on this occasion, turning Yoan Gouffran's centre past Simon Mignolet in front of a shell-shocked Kop after 20 minutes. It looked as though the hosts were going to be frustrated, until two almost identical goals from set-pieces midway through the second half from Daniel Agger and Daniel Sturridge changed the game. The visitors had Shola Ameobi sent off for dissent in the aftermath of Sturridge's winner, as Newcastle suffered an eighth defeat in the last 10 Barclays Premier League outings and their woes were further compounded when Paul Dummett also saw red late on. Tottenham Hotspur secured sixth place and a spot in the UEFA Europa League with a 3-0 win over Aston Villa. Paulinho scored first, capping off an intricate move after 14 minutes. The hosts had to wait another 21 minutes for their second as Nathan Baker scored an own goal. Emmanuel Adebayor grabbed the third from the penalty spot towards the end of the first period and although Villa were slightly improved after the break, Paul Lambert's men rarely showed anything to worry the hosts. Norwich City's relegation was confirmed as Arsenal warmed up for the FA Cup final with a comfortable 2-0 win at Carrow Road. The Norfolk side were effectively relegated after Sunderland's 2-0 win over West Bromwich Albion on Wednesday but their drop into the Championship was rubber-stamped four days later after second-half goals from Aaron Ramsey and Carl Jenkinson gave Arsenal victory. Ramsey's goal, a stunning volley that crashed into the top-left corner, was special and Jack Wilshere's return from a broken foot after the hour-mark added to Arsenal's joy. Arsenal's fifth top-flight win in a row is sure to boost confidence ahead of Saturday's FA Cup showpiece against Hull City, as they go in search of their first trophy since winning the same competition in 2005. Chelsea brought down the curtain on their campaign with a 2-1 win at Cardiff City. Late strikes from Andre Schurrle and Fernando Torres earned the points after Craig Bellamy's deflected effort had given Cardiff a first-half lead. Garry Monk celebrated his permanent appointment as Swansea City manager by guiding his side to a 3-1 victory at Sunderland. Manchester United fell short in their bid for a UEFA Europa League place next season after a 1-1 draw at Southampton. United required a victory and defeat for Spurs against Aston Villa to steal sixth spot, but results transpired against Ryan Giggs' men. Juan Mata levelled for the visitors early in the second half with a sumptuous free-kick that gave Artur Boruc absolutely no chance in the Southampton goal after Rickie Lambert had broken the deadlock with a 28th-minute opener. West Bromwich Albion's Barclays Premier League status was confirmed for another season despite a 2-1 defeat by Stoke City at The Hawthorns.